We have covered a free application which installs multiple versions of Internet Explorer on Windows. This is handy for web developers to check the design in different versions. From the same developer we have another free tool called Utilu Mozilla Firefox Collection, which installs multiple versions of Firefox on your Windows. With this freeware, you can quickly see how your websites look when rendered using different versions of the Gecko render engine. 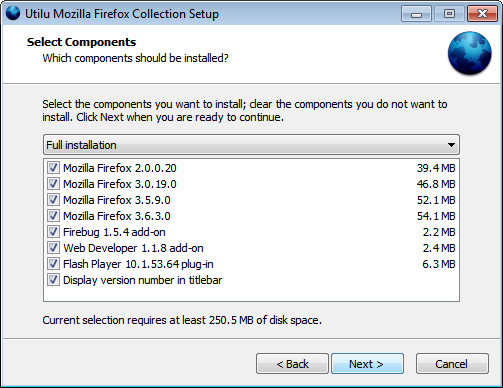 When you install the application, it asks which all versions of Firefox needs to be installed. It also supports Firefox and Web developer add-on. You can also specify the filenames or locations (URLs) to open in all installed versions, which means the specified URL will be opened in all versions of Firefox simultaneously.